Les Suisses is a small hamlet in the middle of the parc naturel régional du Morvan, between the villages of Moux en Morvan and Montsauche-Les Settons. It is located in an area of outstanding natural beauty with many walks and cycle trails from the doorstep. The area teems with wildlife and with red squirrels, deer, pine martens and buzzards all having been seen by guests staying here. Star gazers will be amazed at the visibility of the milky way at night. 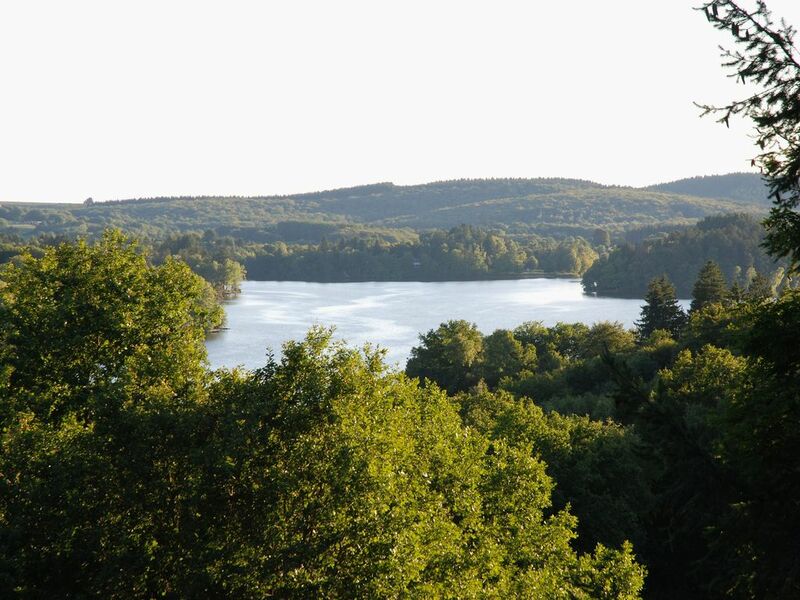 Lac des Settons is less than 5 minutes walk away via a picturesque footpath with only one country road to cross. In the summer, a quiet lakeside beach is less than 10 minutes walk, with the Lac des Settons watersports centre and restaurants around 15 minutes walk (or less than 5 minutes to drive). During July and August there are numerous activities for all the family around the lake – pedallos, bike hire, boat hire, wind-surfing, bungie trampolines, and lake tour boats. Also, horse-riding, quad biking and river rafting are all available through local companies. So whether you are a walker, cyclist, swimmer, fisherman or just want to relax on the terrace with a good novel there is something for everyone at Les Suisses. Between Easter and late autumn there are a number of good traditional French restaurants within easy reach of the house (3 are within 15 minutes walk). More restaurants are a short drive away and include a pizza restaurant and a creperie. For those with a generous budget the 3 Michelin starred Bernard Loiseu restaurant in the nearby town of Saulieu is about 20 minutes drive away. The local area is crammed full of history with plenty to see and experience. Find out about the Romans and Gauls at Bibracte and Autun (1 hour and 40 mins away respectively), visit the Unesco World Heritage site at Vezelay (1 hour away), find out about la Résistance at the museum at Saint-Brisson (15 mins). Or visit the local museums and exhibitions at Chateau Chinon (30 mins) and Saulieu (20 mins). And of course, Burgundy is famous for its world class fine wines. The beautiful town of Beaune, with its famous vineyards, is around an hour's drive from Les Suisses. We are two families who live in London and we jointly own, and love, our beautiful getaway house at Les Suisses. We have spent many happy holidays here with extended family and friends - ages from 6 months to 80 yrs+. Without fail, everyone who comes to stay has a thoroughly relaxing and enjoyable holiday. We have many requests for repeat visits! Our normal working lives are always busy and often stressful, so Les Suisses provides an antidote to modern living and enables us to unwind and recharge our batteries. We particularly enjoy spending time in the garden and by the lake with swimming, boating, walking and cycling being particular favourites. And of course, French wine and food! We fell in love with the Morvan on our first visit so no where else would have done for our escape holiday home. The house and garden were magical and the closeness to the lake lends an other worldly feel. You truly feel you have escaped the city when you arrive here. From the moment we arrive at Les Suisses we feel the stresses of life ebbing away.... The Morvan is a semi mountainous area, so wooded hills and lakes are seen wherever you go in the area. The weather is variable (which we also like! ), from hot summers to bitter and snowy winters. And there is plenty to do. Whether you like outdoor activities, relaxing in the house or garden, or visiting local towns and markets. There is just so much to do! There is something for everyone. In the summer time, swimming in the lake is glorious. And all year round, walking and cycling on the many paths that start right from our gate mean that we can get out and enjoy the beautiful countryside all year round. The house has two bathrooms. Upstairs there is a large family bathroom with corner bath and separate shower, basin & WC. Downstairs there is a further family shower room with basin and bidet plus a separate WC. Electric heaters available in all rooms and underfloor heating in some of the upstairs rooms. Rural location so not great bandwidth but ok for web browsing, emails and WhatsApp. The lounge area has 3 sofas, TV with basic UK television channels, DVD player and CD stereo player. There is a highly effective large wood-burning stove plus an open fire. The kitchen is open plan with the lounge & dining area. It comprises a large gas cooker, fridge, microwave, electric kettle, toaster plus a comprehensive range of cooking and dining utensils. The dining table is large and comfortably seats 10 people. Very large dining table with additional dining area on the veranda. Two TVs available for playing DVDs - there are plenty of films in the house. Live TV is not available. DVD player available and a collection of films. Not maintained, but a number of children and adult bikes available. Space for full dining and outdoor seating. Outside: The garden is large and informally laid out on several levels - ideal for children of all ages to play, explore and adventure in. Although it should be noted that very small children would need to be supervised at all times. There is a large terrace off the living area with views over the garden and Lac des Settons. A large outdoor dining table provides a delightful al fresco eating area. There are many activities available on and near the lake in summer including pedallos, bike hire, swimming and various watersports. There are several secluded beaches plus one beach with a life guard in high season. Utility Room: In the basement is a utility area with washing machine, tumble dryer and sink. Also in the basement is a large fridge-freezer. Cleaning / Towels / Linen / Maid service: Bathroom towels and bedding are provided, plus a cleaning and laundry service on departure is included in the rental price Other: Upstairs is a “snug” with a sofa, DVD/TV plus DVDs, books & range of board games. The house also has a basement with a large open space, with a garage door opening out onto the garden. There is a full size table tennis table and various outdoor games. Great house, great location, great owners. Thanks Jim, it was great having you! We have no hesitation in recommending this delightful house. It is spacious and extremely well equipped. It's primarily aimed at families with children but our group of five adults also found it near perfect. We didn't have the best weather but on one hot day we spent some brilliant time by the lakeside. Other highlights included trips to Vezelay and Autun, the bird life on the balcony (a friendly nuthatch!) and cooking in the excellent kitchen. Everything was in good condition and we appreciated extra touches such as a welcome pack of food and liberal supplies of towels. Luckily we had no difficulties but all communication with the owners was friendly and helpful. We've just spent a week at Les Suisses with friends and had a lovely, relaxing holiday. The house was comfortable, immaculately clean with lashings of hot water and the starter pack of wine and provisions was an unexpected, welcoming touch. It is a very spacious house so even with a big group, you wouldn't feel cramped and it is so well equipped with every modern convenience and lots of leisure activities, there is just nothing missing for either an energetic holiday or lazy days like we had. We spent our week sun-lounging on the terrace enjoying the views over the woods towards the lake and had occasional sightseeing trips and walks when energetic. Don't miss Vezelay acknowledged as one of the most beautiful villages in France. We particularly enjoyed a meal at "The Little Pub" - despite its name the restaurant serves delicious, French cuisine. There really is something for everyone at this location and the house really lived up to its description. The only downside - the beds were so comfortable, we couldn't get up. Nothing to do with the excellent local wine!! Mit dem Haus und den Informationen vom Gastgeber waren wir rund um zufrieden. Wenn jemand mal richtig vom Alltagsstress abschalten möchte so ist er hier richtig. Gastgeber immer sofort auf irgendwelche Fragen einem geholfen haben. Wir haben die 2 Wochen Internet/WLAN- freie Zeit jedenfalls geniessen können:)!. Maison confortable, grand terrain d'aventure pour les enfants, proximité du lac, belle région... Prêts à revenir ! The house is about 6-7 hours drive from Calais and around 3 hours drive from Paris. Nearby towns are Saulieu (20 mins), Chateau Chinon (30 mins) and Autun (40 mins). Nearest villages are Les Settons (3km), Moux (6km) and Montsauche (8km). Les Suisses is a rural hamlet and outside of the busy summer season it is quiet. During the summer, the area comes alive with many activities centred around Lac des Settons. By the lake are several small restaurants and bars - all between 10 minutes and 1 hours walk. The distance around the lake is around 10 miles and can be comfortably completed in 4 hours (quicker by bike!). The nearest village (Moux En Morvan) is about 6km away and has a good bakery, small supermarché, 2 restaurants/bars and 24hr petrol. During high season there is a campsite shop about 10 minutes walk from the house selling basic supplies and fresh bread daily. Between April and October there are several good restaurants a few minutes away. At Les Settons there is a small cafe and a shop selling a range of supplies and gifts plus fresh bread daily. There is also weekly (Thursday) market during July and August. Booking Notes: A deposit of £100 is required to secure the booking with the balance payable 2 weeks prior to arrival. In addition a £100 deposit is required at the time of booking as a caution against damage to the property. This is refundable after your holiday. Arrival after 4pm. Departure before 10am. Please contact us for early arrivals or late departures. Changeover Day: For weekly rentals, Saturday is changeover day. For shorter rentals, please enquire.